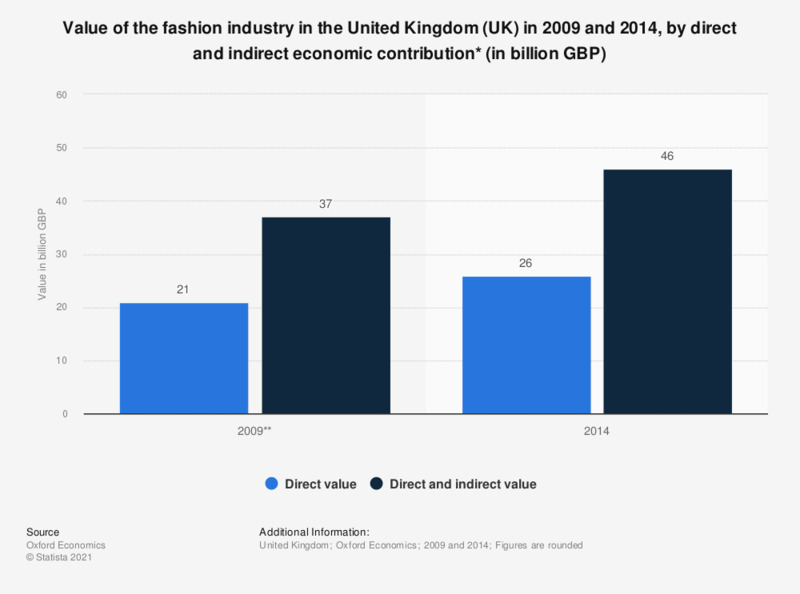 This statistic shows the direct value of the UK fashion industry to the UK economy in 2009 and 2014, alongside the total contribution of the industry to the economy including indirect demand, such as via the supply chain industries and induced spending of employee's wages. In 2014, the direct value of the fashion industry was measured at 26 billion British pounds (GBP), with a total contribution of 46 million. * 'Direct value' is value from the direct activities of fashion retailers, wholesalers and manufacturers to the industry. 'Indirect value' is the indirect value added through the industry supply chain and induced spending of employee's wage income.